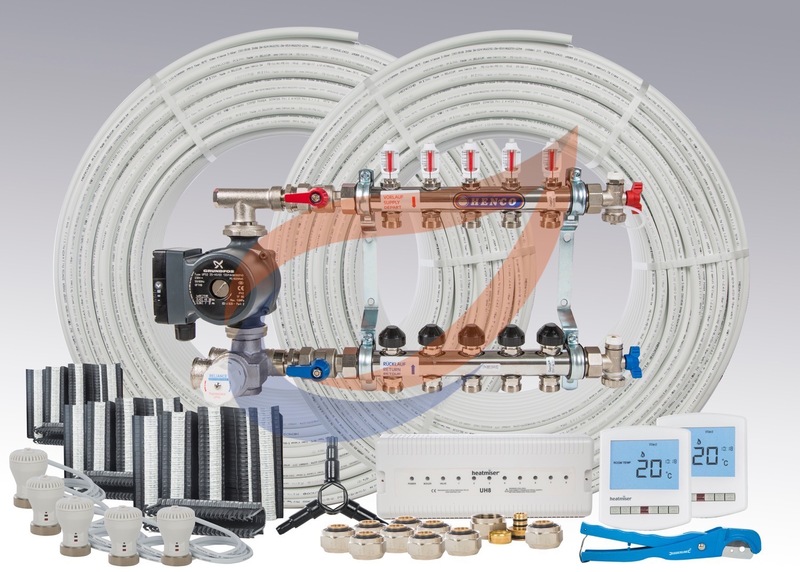 Best quality underfloor heating kits available 24/7 online – with added security ! Our top selling underfloor heating kits are available to order online via our underfloor heating store. Thanks to high quality images of all items included within each particular kit, you can see exactly what you’ll receive with your order. Since our photo shoot the pumps have been upgraded though from Grundfos UPS2 to UPM3. Please visit https://www.underfloorheatingsystems.co.uk/products/ and enjoy the experience. For practical reasons the kits available online only go up to 100 m2 and 2 zones. For larger floor areas – or for more zones (thermostats) please forward us your floor plans to info@underfloorheatingsystems.co.uk. We can then design your underfloor heating system and quote accordingly. Our Heatmiser thermostat options online are dial thermostat DS1, programmable Slimline, wireless programmable Slimline-RF or neoStats with Hub. As the majority of customers use their own perimeter (edge) insulation e.g. 25mm Kingspan, we do not force our customers to pay for rolls of edging strip if not required. Hence we keep this as an additional option – buy only if needed. Our secure online shop accepts orders 24 hours a day. Free standard next (working) day delivery is included. Options exist for special ‘Before Noon’ or ‘Before 10.30 AM’ delivery. Our E-commerce website is approved by ‘Verified By VISA’, ‘MasterCard SecureCode’ and ‘SecutrityMetrics’. Our E-commerce website is scanned regularly by SecurityMetrics on behalf of Global Payments. This guarantees you can shop with confidence when using our secure website. Whilst we take security extremely seriously, we’re also proud to offer superior quality in form of Watts manifolds and Henco pipe. Many online retailers call their pipes “European Standard” which they apparently legally can, despite their pipes originating from the far east. Regardless, we actually supply what we show and quote for, and are proud of it.